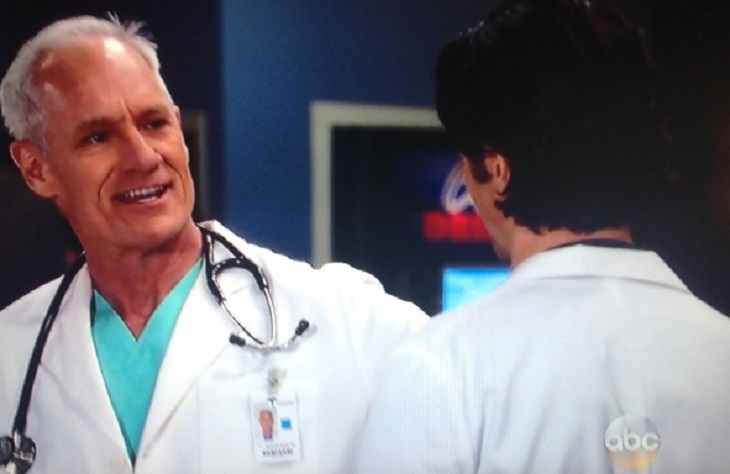 Matt Riedy may be out as ‘General Hospital’s’ Dr. Mayes but the actor spoke with Soap Opera Digest about his brief stint on the ABC soap opera. Dr. Mayes was originally introduced as a neurologist for Sonny Corinthos [Maurice Benard] however; he remained a member of staff at the hospital. He further became the latest victim in the line of murders at the hospital. In this regard Reidy sat down with SOD and dished of his brief GH run. Reidy dished that he was open to anything, in terms of storyline. When SOD made mention that they thought something was developing between Dr. Mayes and Monica [Leslie Charleston], he shared “I was open to anything!” Reidy highlighted that his time at ‘General Hospital’ was like a gift to him. He made mention of Robin Riker [Naomi Dreyfus] which he ran into on set. In regards to his character he highlights that it was fun to play him having played cops, lawyers, doctors, business people and people in charge in the past. When SOD brought up the subject of a possible return to GH he was definitely open to it. Reidy said that working with the cast and crew was fun so if the request came for him to go back he would. Wouldn’t you love that GH fans?